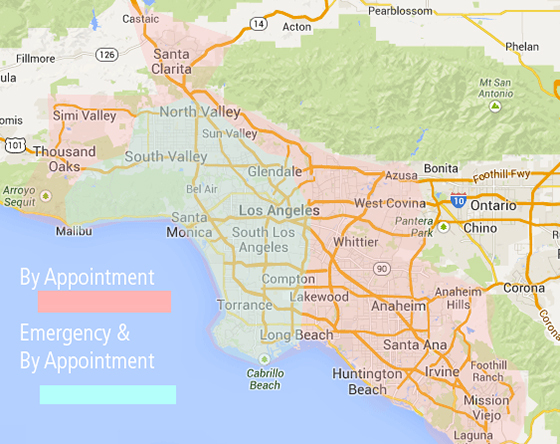 To schedule an appointment or if you have an emergency please call us at (323) 238-2368. Thousand Oaks, Simi Valley, Santa Clarita, Azusa, West Covina, Whittier, Lakewood, Anaheim, Long Beach, Huntington Beach, Anaheim Hills, Santa Ana, Irvine, Foothill Ranch, Mission Viejo, Laguna Beach, and the entire red shaded area below. North Valley, Sun Valley, South Valley, Bel Air, Malibu, Glendale, Los Angeles, South Los Angeles, Compton, Long Beach, Torrance and the entire green shaded area below.